Unfortunately the Museum of the Confederacy (MOC) wants to consider giving my newest book an award. This is a book designed to expose the real nature of the Confederacy and the neo-Confederate movement as being about slavery and white supremacy. No doubt they think that by giving this award they can co-opt James Loewen and myself and position themselves as different from the rest of the neo-Confederates. As you know, institutions give awards because by honoring others they honor themselves. I don’t want to honor the Museum of the Confederacy, I don’t want my name or my book be used to legitimize them. John Coski has approached my co-editor and asked for copies of the book, and despite my strenuous objections copies are going to be sent. I also wrote five certified letters, four to the judges telling them that I don’t want the award and one with copies of the other four letters sent to the Director of the MOC. One would think this would result in my book being thrown out. However, I got an email from Coski saying basically I had no say in the matter. 1. Make my opposition public so that they are more likely to reject my book. 2. Use this consideration of my book as an opportunity to make my criticisms of the Museum of the Confederacy more widely known. And there is information on the MOC. A speech by Ludwell Johnson III, given at the Museum of the Confederacy, on his being made a Fellow of the Museum and reprinted in the 3rd quarter 1994 issue of “Southern Partisan” is an appalling denigration of African Americans and African American scholarship. 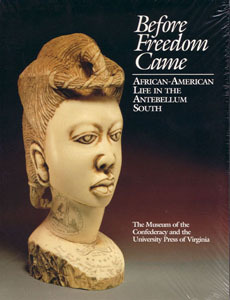 Their book “Before Freedom Came” is explained as a rebuke to Carol Moseley-Braun in his speech. I think that they still give a Jefferson Davis award is appalling. The man was vile. I read a section on the congressional record where they wanted to help out Africans who were on board a captured slave ship and Jefferson Davis is simply appalling in his opposition to helping out these poor persons sweltering in a slave ship off the coast of Florida. I am going to write up some essays about the MOC and their activities. I have a file which I am going to review. Perhaps some of the members of this listserve would like to write essays on the MOC. Again, I am open to some advice to make sure this award doesn’t come to my book. I feel it would be a stain on my reputation. Letter follows my name. I still have no idea why Sebesta has taken this stance. As I stated in my last post he seems to be ignorant of the good work that the museum has done to further a scholarly understanding of the Civil War – the very thing that Sebesta and Loewen claim to support. If the MOC was nothing more than an extension of some “Neo-Confederate” organization than why would they consider his book? Even more bizarre is the reference to their publication, Before Freedom Came, which I am quite familiar with and have used in the classroom on numerous occasions. It’s obvious to me that Sebesta does not own a copy nor is there any indication of its contents. This is an edited collection that includes essays by Drew G. Faust, John Michael Vlach Charles Joyner, Deborah Gray White, David R. Goldfield, and Theresa A. Singleton. Anyone familiar with the historiography of slavery and the history of the South would be hard pressed to describe these individuals as promoting anything other than a scholarly view of the subject. As far as I am concerned Sebesta is doing little more than engaging in the slandering of an institution that deserves our full support. I understand that James Loewen will accept the award, if given, but in the name of education and the promotion of scholarly history Loewen ought to reign in his erratic co-editor. This must be incredibly embarrassing for him. I was trying to find the Ludwell Johnson speech/article he references, and ended up reading some MoC history – which is quite a story, really – and I suspect that Sebasta is, among other things, falling prey to a kind of originalist error: since the MoC started as a Southern pride institution (though “neo-confederate” seems a stretch), by definition it cannot transcend its early origins and associations. While I’m a little more sympathetic to his complaint about a “Jefferson Davis award” (especially one emblazoned with the Great Seal of the Confederacy), the list of recipients belies any partisan or retrograde purpose. You are probably right. The MOC’s history is quite rich given their founding, but as you point out it has evolved over the past few decades. In fact, there are plenty of folks, who fervently believe that the MOC has betrayed their original purpose. I’m not too sympathetic when it comes to the book award. After all, they are awarding sound scholarship and in doing so steering clear of any kind of celebration. You may have already seen this, but here is a brief look at how the Virginia SCV felt about the new MOC in 2008. http://scvva.org/pipermail/vacourier_scvva.org/2008-June/000307.html I’m sure there are other articles out there that echo this sense of betrayal. It really does come down to a difference over whether the MOC ought to be a museum for the Confederacy as opposed to a museum about the Confederacy. My own view is that the museum shows the most respect for the past when it commits itself to sound scholarship. I might also add that the man who is trying to give Sebesta this award, John Coski, recently published what is perhaps the definitive history of the Confederate battle flag. It is an excellent account that in no way adheres to “neo-Confederate” ideology. I’m as clueless as you are regarding these emails. An extremely bizarre stance and PR campaign. I don’t believe it’s realistic to expect Loewen to be able to control Sebasta (I”m not sure if any force in nature can do that) but, IMHO, what Loewen needs to do is to make his own position clear. I don’t believe he has to be lengthy or attack Sebasta, but I do think he needs to say that he does NOT agree with Sebasta’s attacks on the MOC or believe that they are substantiated in any way, that he supports the MOC, and, if the work is chosen, will be honored to accept the award. I think that Loewen should decide to sever the working relationship. Kevin, you know my position on the neo-Confederates and the bilge that they are trying to claim is serious historical works. However, nothing they do justifies someone like Sebasta using their tactics, even if it is, at least ostensibly, against them. If someone is willing to trample on the facts and use hysteria instead of reason and scholarship to support their conclusions, I will oppose them even if the conclusions they to which they come are ones that I support because their tactics are despicable and undermine the position they claim to support. I’ve quoted the old law school maxim to you before and I still believe strongly in it: “If you have the facts, argue the facts. If you have the law, argue the law. If you have neither, pound the table.” To me, pounding the table is an admission of failure. I agree with you re: what Loewen ought to do. Like you, I am a member of the MOC and support their efforts fully. This situation is a real shame and difficult to comprehend as you mentioned. I do not know Sebesta personally, but the impression I get from this is that it is a publicity stunt to drum up interest and sales for this book. You are not the first person to suggest such an interpretation. What is truly sad, however, is that their book is intended to challenge certain beliefs about the Confederacy/Civil War and that is exactly what the MOC has strived to achieve. This is so incredibly irresponsible on Sebesta’s part. It seems that Sebesta’s not in touch with the new reality of the MOC. He fails to see the MOC is one of the best ways to combat the Neo-Confederate agenda that he so dispises. It seems to be just another knee jerk reaction on his part. I think he is just being a drama queen. On the other hand, he’s always been a lost Napoleon 12-pounder. Maybe Sebesta’s Bosses at the UT should call him in the office and straighten him out or better Fire him. As a Tax paying Texan I am upset by his childish actions concerning this award from like you said Kevin a well respected Museum. It’s not clear to me that he has any “bosses” at UT. The UT Press published one of his books, but I don’t see any other connection. He’s not in the university’s online directory. I don’t actually know who he works for. I would love to know what the good folks at the University Press of Mississippi think of all of this. Your comments have almost nothing to do with the subject of the post, which is why this last one has not been approved. Apparently, you have your own blog, so I suggest you use it. I’ve read a lot about Sebesta over the last couple of years, and a lot that he has written. His major problem is that he can’t distinguish between Neo-Confederate and Confederate. Two different animals,IMHO.